because the instrument used is super sharp. Healing results are much better as well, as skin heals faster with almost no scabbing. It is the world first for a natural permanent make-up for eyebrows. 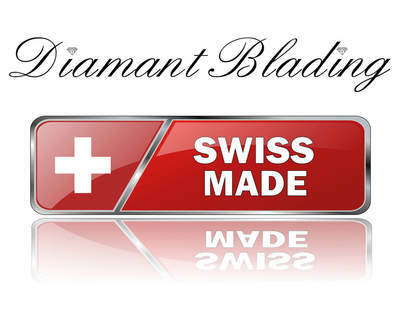 With this exclusive, new and unique evolution of the Diamant-Blading method, the skin is bladed with a real cut diamond. Blading or bladed means that it is a hand method and no permanent make-up machine is used. Through this fine bladed cut of less than 0,05mm width, a very fine and natural hair look is formed like it could not be pigmented before. Please do not confuse this with the micro blading method. 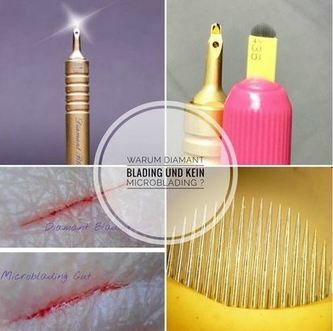 This new Diamant-Blading technique creates a lot of new and unique possibilities to create a permanent eyebrow make-up. The diamond blader is developed and produced in Switzerland, which guarantees an excellent quality and safety. Only the original is good enough for you. The fine and feathery hair look looks so natural that it is not recognizable as a permanent make-up anymore. 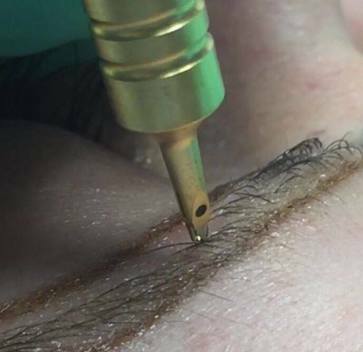 DIAMOND BLADING is a semi-permanent eyebrow treatment that is carried out using a specialised manual hand tool which holds disposable special blade with a Diamond, and implants certified colour onto the skin. This new technique called Diamondblading has become incredibly popular as an alternative to tattooed brows. Your eyebrows are an extremely important feature on your face, framing your eyes. No needles ! No machines ! Beauty-Hour Diamond Blading is carried out using a very fine blade to deposit pigments into the epidermis. Before starting, our specialist will measure and observe the symmetry of the eyebrows with your face. Usually there should be a space of about 3 cm between your eyebrows but that depends on your facial structure and your set of eyes. When microblading, the skin with steel needles "ripped" or "torn" and pigments are introduced into the uppermost layer of skin ... it comes to redness, swelling, scabbing, lymphatic fluid, etc. The color pigments settle in the scribed area and come with the time wider and uneven! If the treatment is too deep, the eyebrows assume a bluish, greyish, etc. color. 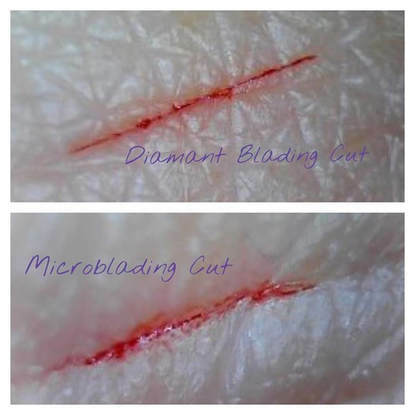 This problem does not exist with diamond blading The wound margin is very clean and smooth, so that the color pigments can not migrate and run during the healing phase, they remain embedded in the fine cut or cut. Do you draw your eyebrows on everyday or just special occasions? Our clients have overplucked eyebrows that in the past were the fashion and now want a fuller eyebrow. We can create subtle to defined and anything in between. Our Düsseldorf based microblading consultation process helps us to determine what’s best for your eyebrows and beauty. We would suggest bringing a photo of your ideal eyebrow or of yourself before over-tweezing so we can do our best to create it for you, but face shape, size and bone structure all play a part in our brow design so bare this in mind. The procedure is split into 2 appointments spaced 4-6 weeks apart in order for your skin to heal. Your new brows will last between 12-24 months as long as you follow all your aftercare. We use a anaesthetics to ensure as minimal pain as possible. When will I see my results ? Immediately your brows will be noticeable, however healing can take anything between 7-14 days. The hand-piece that is worked with is 11cm long and weighs about 45g. It is made of titanium and a real cut diamond especially developed for the permanent make-up. complement your look & style. mapping formula to design your unique shape and begin to sculpt your brows. The results are Beautiful & natural! Our Beautylounge is near the International Airport Düsseldorf !